Ozcranes is the website of the Australian Crane Network, an informal voluntary network linking people in Australia and New Guinea who work with Brolgas Grus rubicunda and Sarus Cranes Grus antigone. The Network includes scientists, other researchers, landowners, bird observers, and landcare and catchment care workers. We share information and news about research, projects and experiences relevant to Brolgas and Sarus Cranes and their habitat, including wetlands, farms and pastoral properties. Please contact us to take part in the Network, or contribute to Ozcranes. For information on cranes and projects in Australia and overseas, check the various sections of this site via the top menu or Site Map. The network began in 2004 with an invitation forwarded through BirdLife Australia from the International Crane Foundation, for crane workers in the Australasian region to collaborate with colleagues in India, Europe, Africa and Asia. 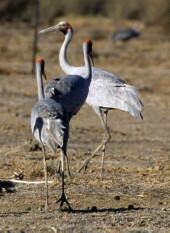 The International Crane Foundation works to protect the world's 15 crane species and their habitats in cooperation with many people, agencies and governments. For links to crane research and conservation organisations in many countries, check Ozcranes Resources». Ozcranes is an informal, fully voluntary Network, and is not funded or seeking donations or financial grants at this time. Ozcranes website The Design background was created by Elinor Scambler, based on a Chinese papercut with a stylised crane displaying towards high clouds. Website design, building, maintenance and content editing are by Elinor Scambler. The Brolga and Sarus Crane paintings at the top of every page are copyright JN Davies, the artist, and used with his kind permission. Ron Hill kindly designed the Crane-Friendly fencing logo especially for Ozcranes Conservation fencing pages. Ozcranes supports the Wildlife Friendly Fencing project. For website content, we rely on in-kind help from the writers, artists, photographers and organisations noted alongside the article or image, please support them if you have a commercial or funded project. We are grateful for web-hosting support by Peter Firminger. The editor relies on commercial hardware and support from FNQ Computers Atherton. Ozcranes aims to be accessible for all web users interested in Brolgas, Sarus Cranes and crane conservation – especially in rural areas where cranes and people live side by side. Even today, rural users have problems with internet speeds and reliability, so Ozcranes keeps images small and page coding as simple as possible, using Web Standards as the key to good user experience. Ozcranes pages can be read in large print and are print-friendly – see the Help» page for details. The site is coded to work in all modern browsers, and some older browsers, at a range of screen sizes and resolutions. The site works well on iPad or tablet such as Samsung Galaxy, but as yet there's no mobile version. If you have suggestions for improving accessibility or usability of the site, please contact us». If you need to know... Ozcranes is hand-coded with CSS3 and xhtml 1.0 Strict, and pages parse as xml. It ‘degrades gracefully’ down to IE5. 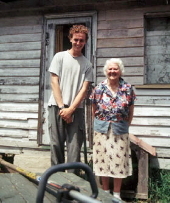 Postal enquiries Australian Crane Network, PO Box 285, Malanda, Queensland, Australia 4885. If you have a commercial project, or grant funding, please support the people who've allowed us to use their photographs and artwork. In alpha (surname) order..
Ozcranes is generously hosted by Peter Firminger of Wollombi NSW. 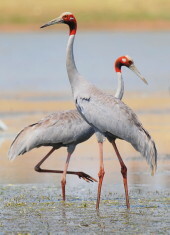 Ozcranes supports Sarus Crane and Brolga research and conservation across Australia. ↑ Ozcranes southern Australia contact, researcher Matt Herring, with a Riverina landholder working to protect Brolga breeding wetlands.